Kiwitub is not a spa pool. 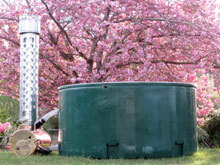 The convection loop hot tub system means no pump, electricity, or chemicals. How can you get water to circulate in a system with no moving parts? Simple. The burner is essentially two horizontal cylinders, one inside the other, with water in between, connected by two hoses to the hot tub. Fire in the burner heats the water which makes it expand and rise up through the top hose and into the tub. 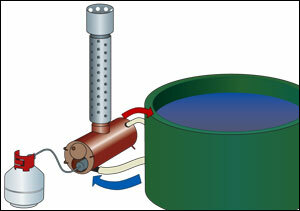 At the same time, cooler water flows in through the bottom hose to replace it. This circulation continues as long as there is a heat source of any sort burning in the burner, so the water in the tub steadily gets hotter. You can use gas, firewood, or some other fuels in the same Kiwitub burner. The patented system has no heavy, fragile, electricity-consuming pumps, unlike a spa pool. Because it heats up so quickly, you just fill it for use and empty it afterwards. So there's no need for chemicals to stop bacteria or algae growing in the water, unlike a spa pool which keeps the same water in for weeks. Once the water is hot, it'll stay that way for several hours: you don't need to keep the fire or gas going. Kiwitub is designed for out-of-doors, manual operation under adult supervision. It does not have an automatic temperature regulator. Just turn off the gas or stop feeding the fire when the water is hot enough. It's that simple. Each component part is simple, tough, and readily moved by one or two people. You can use it at home or take it places. A lot of places.